The Mr. Crappie Slab Shaker is the ultimate Crappie fishing reel. 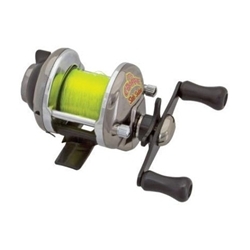 This reel icludes an Anti-Reverse Lever, Audible Bait Clicker, and a Spool tension adjustment control. The Slab Shaker has unique Mr. Crappie cosmetics with a Strong, plated metal frame for those big Slabs! It also comes Pre-Spooled with premium MR. Crappie Line.